beckie726 My dad used to take us fishing when we were kids. I've enjoyed the sport for many years --nothing compared to catching and preparing your catch for a family meal! Great fun, and very fulfilling! From salmon, to catfish, to bluegill...small mouth bass...GREAT FUN!! Fly fishing requires talent with equipment... 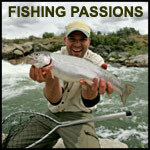 Although saltwater fishing is of another talent base. I would go where ever the crowd would like to go. Looking for other gay guys who enjoy the outdoors. I love fishing, hunting, camping, etc. I would like to find someone for friendship, companionship, and a possible relationship. My own fishin holes I mostly fish in my own pond and my cousin's, but I do enjoy fishing once in awhile and do enjoy eating the fish. Freshwater. Well it all stated when I was about 8 yrs old when my dad came home from work carrying 2 cane poles and ask if I wanted to go fishing and the rest is history.